Reads All The Books: My Whirlwind 'vacation' and giveaways! Wow, well, I am back from my whirlwind 'vacation' and in dire need of a vacation, hahaha. I went from Virginia to Disney World, back to Virginia to drop off the family and then on to Philadelphia for Apollycon2015, then back home in the span of 1 week and 4 days and I had an amazing adventure. I ran the 10k dressed as the 'Little Mermaid' (it was cold and I hadn't planned on the undershirt, thankfully my husband had one I could steal, haha), this was toward the end of the race and my knee was aching a sleep deprivation was catching up, haha. I went out on a limb for the Princess Half. While most people dressed as princesses I threw caution to the wind and went with my favorite, The StarLord. I am pretty sure Cinderella was thinking "What the ever loving...." But I don't care, I had a great time. Yeah, so this was me after the half marathon. I went against my plans and pushed myself during the 10k so my injury acted up the entire half marathon, I walked like a zombie for a good three days after finishing all the races. One of my favorite signs and let me tell you after it was all over and that bag of ice was melting down my leg as I limped toward the bus with a huge smile/grimace on my face I questioned if I should have just accepted the proposal, haha. The Moment we all run for, getting to the castle. It was so amazing getting to run through the castles portico and being greeted on the other side by all the runners families and friends. It was a needed boost to get us through the last miles of the race. Momma said there would be days like these, hahaha. This photo just cracks me up. My celebratory beer and apparently it was a hard few days on the biggest of the small ones as well. *wink* I promise that's root beer. What an amazing event. Damaris and her staff did a fantastic job putting together this event. It was a huge success, even though I think we wore poor Jennifer L. Armentrout and Drew Leighty, (AKA Seth, the cover model for Jennifer Armentrout's book The Return.) out. They signed books, bags, and posters from 11am-630pm, they plain just rock! Some how Wendy and I managed to not get a picture together but she did take one with the StarLord, haha. Wendy Higgins with Matt D. (If you don't know Matt you should! He is an amazing guy and such an awesome book fan!) he won the costume contest for his take on Apollo and seriously how could he not have, I wish you could see his shoes! Those eyes though Matt, those were creepy, hahaha! Me with Jay Crownover, another all time favorite author of mine. She writes fantastic gritty love stories (Marked Men and The Point series) and is just an awesome chick! You want to have a beer, talk tattoos and hot book boyfriends this is your girl! Love her to pieces! After all that, the StarLord and I were exhausted by the time we got home and in need of an 'actual' vacation, haha. This is a picture of some of the books I was able to have signed at ApollyCon. Jeanine Frost rocked my world when she didn't bat an eye at that pile of books and surprised me by personalizing each one! I about cried when I got home and saw she had done that. So to celebrate I have two giveaways for you! 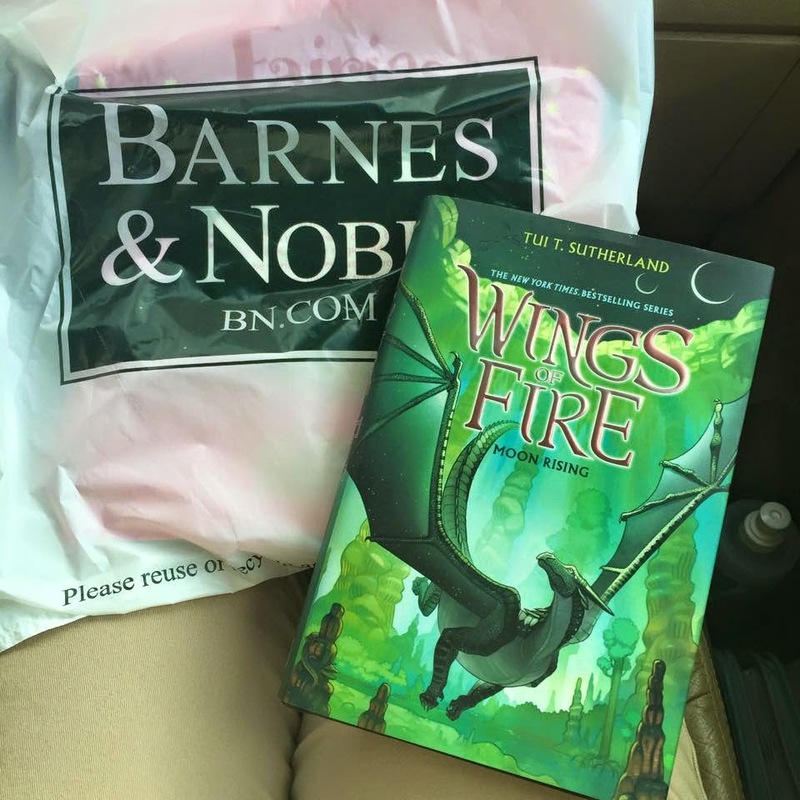 The first is for a hard bound copy of Tui T, Sutherland's 6th book in her Middle Grade Series, Wings of Fire. You may remember how the book didn't arrive in time for our departure to Disney World and we had to stop at a Barnes and Noble along the way to buy another copy for my oldest to read during the trip, which leaves me with an extra. Also since this is the 6th book I will add in a e-copy of the fist book in the series. So thanks for stopping by and sticking through all my pictures etc, good luck everyone who enters! Happy Reading! You are my queen!!! :-) Love ya, Malissa. Thanks for everything. Best assistant ever. Not sure what I'm more jealous of, you going to Disney World or Apollycon! One day I'll get to a signing and I cannot wait for that day. Thank you for the chance! *I really hate when Blogger doesn't tell me I have a messag3, boooo* I hope that you get the chance to hit up either or both soon. I love going to author signings and getting to know all the amazing authors out there, especially when you can see just how much it means to them that you have read their books! The fans are also so much fun to interact with! Fingers crossed for you!